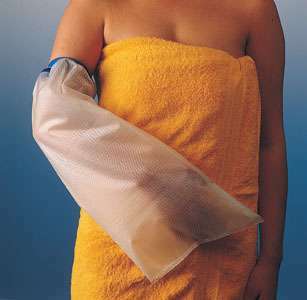 To help protect when showering or bathing here are a few waterproof cast protectors that Oakville Care Centre supply. The Limbo cast protectors are garanteed to last the length of time a plaster cast is usually kept on - around 6 - 8 weeks. These comfortable waterproof protectors simply slip over a cast or dressing on either the lower leg or arm to protect them when taking a bath or shower. They are re-usable and will last up to two months with average use. Not suitable for use with open or undressed wounds or when swimming. 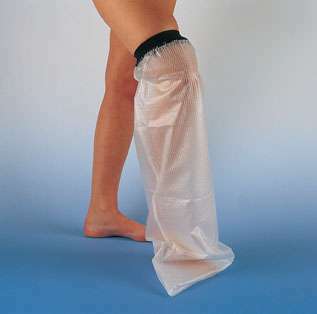 This Waterproof Stocking is designed to keep the leg dry when showering or bathing. Ideal for dressings or a plaster. Containing 5 reusable stockings and 2 straps and one absorbent band. Acu Life Shower Sleeve provides a safe, easy and effective method to keeps injuries dry. 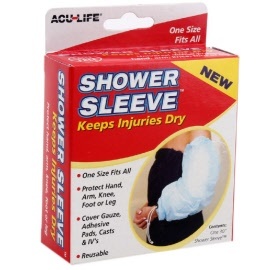 Acu-Life Shower Sleeve comes in one size, fits all. Protects hand, arm, knee, foot or leg. Can be used to protect - cuts, post-surgical incisions, burns, casts and abrasions. Bath Steps and Bath Rails to help the user enter and exit safely from the bath. Our bathing accessory products section includes towel off shampoo and body wash - no water needed, Shampoo caps, flannel straps and even a toe washer! The Push Button 7 Day Pill Box is opened at the push of a button. Each compartment is curved so that the pills are easy to remove. Each day of the week is conveniently split into a.m and p.m sections.